Visit the seaside village of Atrani for a peaceful escape on Italy’s Amalfi Coast. Enjoy the charms of the Amalfi Coast in the pretty town of Atrani, just a short stroll from the popular travel destination Amalfi in southern Italy’s region of Campania. Separated from Amalfi by a rocky mountainside dotted with medieval watchtowers, the little village of Atrani has its own unique charms to discover. Despite Atrani’s proximity to its larger and much more well-known neighbor, the residents have always maintained their own identity, traditions and even their local dialect. 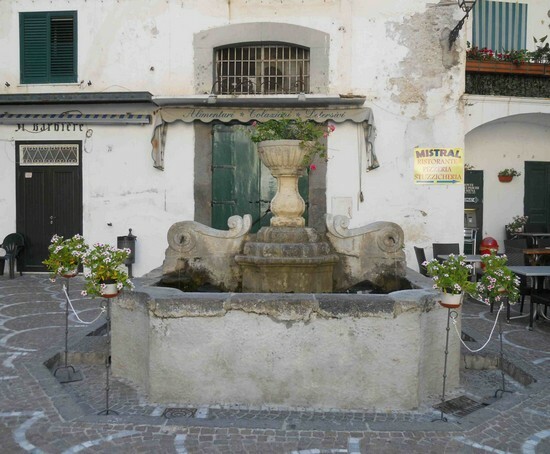 The village has an intimate and friendly feel, and is an ideal spot to get away from the crowds on the Amalfi Coast while being located within easy walking distance of Amalfi and a short drive from Ravello. Atrani is situated at the base of a river valley, and its pastel colored buildings are stacked one on top of another up the side of the mountains in the traditional style of the Amalfi Coast. 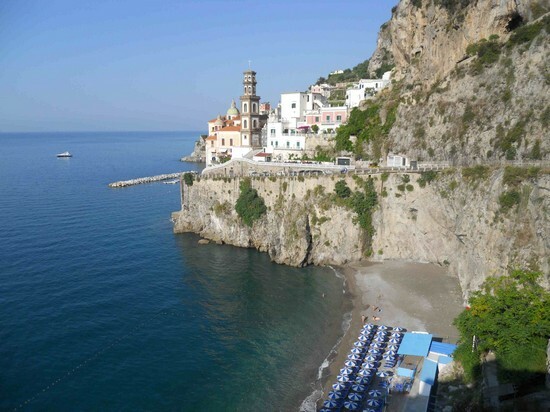 However, Atrani is easy to spot from sea by its two most distinctive architectural features. On one side of town the beautiful Collegiata di Santa Maria Maddalena sits overlooking the water with its yellow and green majolica tile dome and striking bell tower. The Amalfi Coast Road curves around the base of the church and runs through town on an arched bridge that was literally built across the front of the town in the mid 1800s. One of the most striking churches on the Amalfi Coast when viewed from the sea, the Collegiata di Santa Maria Maddalena was founded in 1274. 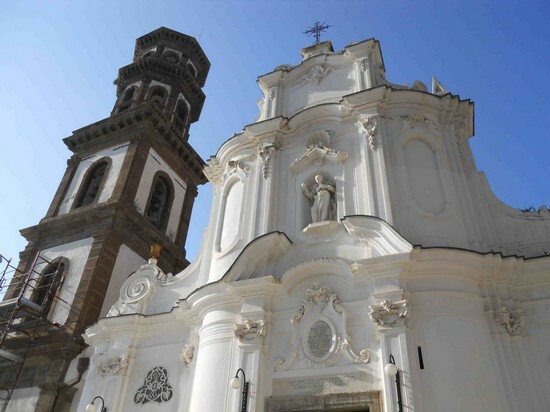 Standing in the small piazza in front of the church, you can look up to admire the 16th-century bell tower and the striking white façade, which is noted as one of the only examples of Rococo architecture on the Amalfi Coast. Inside, the nave is decorated in a lavish Baroque style. One of the best times of the year to visit the church is during the Festival of Santa Maria Maddalena celebrated in Atrani on July 22nd. 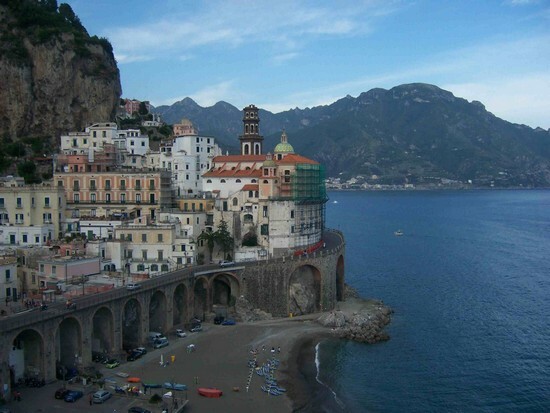 The religious procession takes place through the narrow streets of Atrani down to the beach. After dark a splendid fireworks display takes place from the sea. The heart of Atrani is the charming Piazza Umberto I, located just steps from the sea through the arches under the Amalfi Coast Road. The fountain in the piazza was constructed in 1927, and has served as the backdrop for many movies and commercials. On a summer evening, Atrani’s central piazza is one of the most peaceful and relaxing spots on the Amalfi Coast. Locals and visitors alike enjoy the outdoor seating at one of the many cafés in this pretty piazza. Located in the Piazza Umberto I is the unusual entrance to the church of San Salvatore de Birecto. 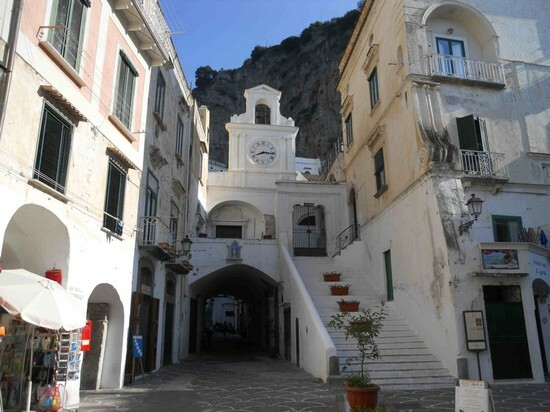 While visiting this church is not at present possible, it has an important history in the Republic of Amalfi. It was in this church in the Middle Ages that the Dukes of Amalfi were crowned, and inside there are many fine architectural works that have recently received a thorough restoration. Of course, one of the main reasons to visit the Amalfi Coast is to enjoy the beautiful beaches, and Atrani’s do not disappoint. 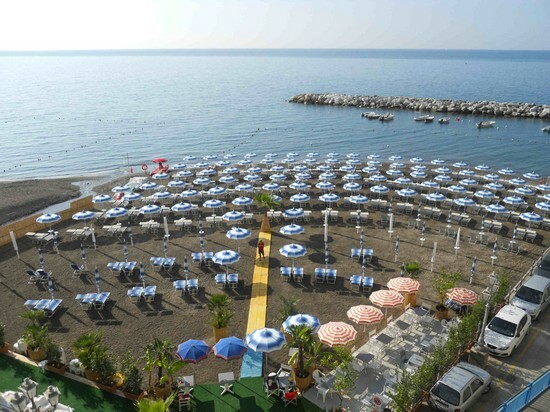 Located just steps from Piazza Umberto I is the small beach of Atrani, which is known for its soft black sand. This is quite the luxury to the feet compared to the pebbly beaches of the Amalfi Coast! Just around a rocky cliff is another lovely beach called Castiglione. Accessible by a long staircase from the road, this beach offers incredible views looking up to the Collegiata di Santa Maria Maddalena. 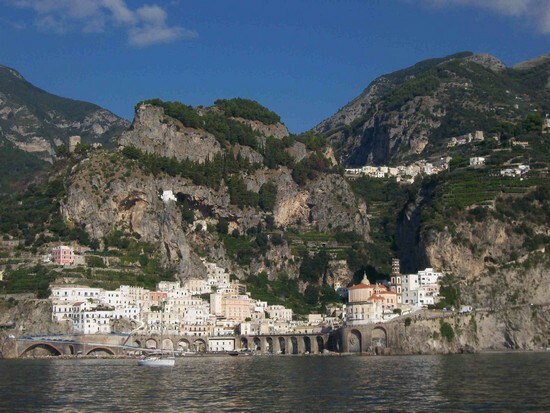 Swim out from the beach and look up at the architecture and the dramatic mountains rising up above Atrani to the town of Ravello located high above. 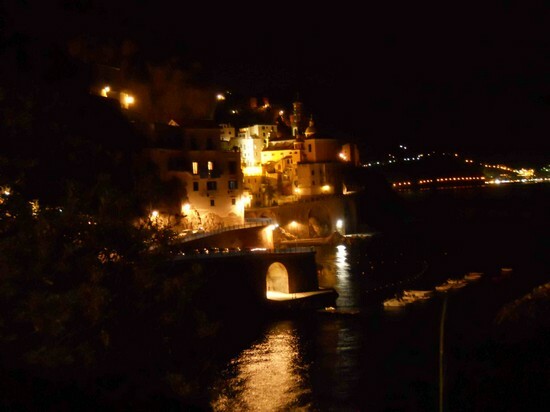 Atrani is absolutely romantic at night, with the lights of the village sparkling on water. Enjoy a seaside dinner, or simply stroll along the water and savor the peacefulness of this charming seaside village on the Amalfi Coast. Loved your story... Walked from Amalfi to Atrani this spring. Over the hill and through the alleys and passageways are the best way to see these wonders of Italy. Cant wait for the 16th and beautiful Atrani. Thanks Laura.